The second issue of Justin Jordan (DEAD BODY ROAD, the Luther Strode series) and Kyle Strahm’s (HACK/SLASH, HAUNT) SPREAD has sold out immediately at the distributor level and will head into a second printing. The series continues to grow in popularity, as SPREAD #1 has sold out once again and will be sent into its third printing. Both issues have sold out completely as readers discover the infectious story that has been compared to John Carpenter’s The Thing. The scheduled reprintings will arrive on 9/10 to meet customer demand. SPREAD #1 reveals that ten years ago, humanity unleashed something ancient that couldn’t be controlled that would later be called "The Spread." Now, deep inside a quarantined zone, one man named No has found what might be the key to stopping it forever and saving the world. In SPREAD #2, the situation looks bleak for No. Raiders, slavers, and a hungry flesh-eating Spreadworm stand in his way. SPREAD #1 and #2 have completely sold out at the distributor level, but may still be available in comic stores. It is currently available digitally on the Image Comics website (imagecomics.com) and the official Image Comics iOS app, as well as on Comixology on the web (comixology.com), iOS, Android, and Google Play. Image Comics is pleased to announce that these first two issues will be going back to print to meet customer demand and to provide further opportunity for retailers to convert more readers to this popular new sci-fi pulp horror. The third printing of SPREAD #1 (Diamond Code JUN148395) will release on 9/10. The second printing of SPREAD #2 (Diamond Code JUN148396) will release on 9/10. 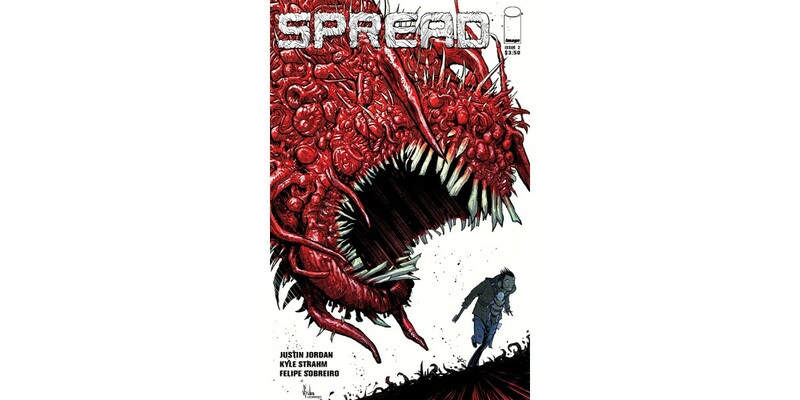 SPREAD #3 will arrive in stores on 9/10 and can be pre-ordered with Diamond Code JUL140576.